Jatujak is named for the largest outdoor market in Thailand, and like its namesake, the major draw is a vibrant selection of Thai street foods. 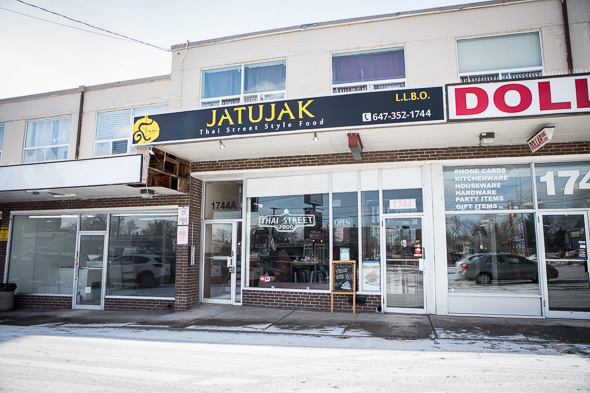 Owners Phanom (Patrick) Suksaen and Chef Suwaree (Aon) Sakoonpham operate two Toronto locations. 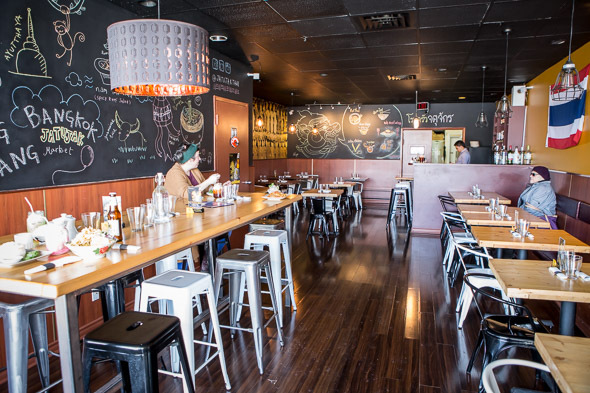 The original outpost on Kingston Road is primarily a takeout and delivery joint, while the younger restaurant on Victoria Park can accommodate double the guests in a full service, 40-seat dining room decorated with flags and chalkboard illustrations. To drink there's Singha beer in bottles for $5.75, house wine by the half litre for $17, and a selection of standard cocktails ($6). 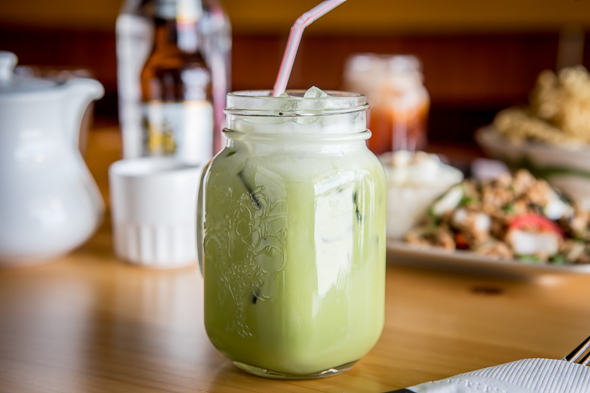 Non-alcoholic Thai iced tea options ($3.50 each), which include Nom Yen, an iced green tea with milk, are popular at lunch hour and available for both dine-in and takeout orders. 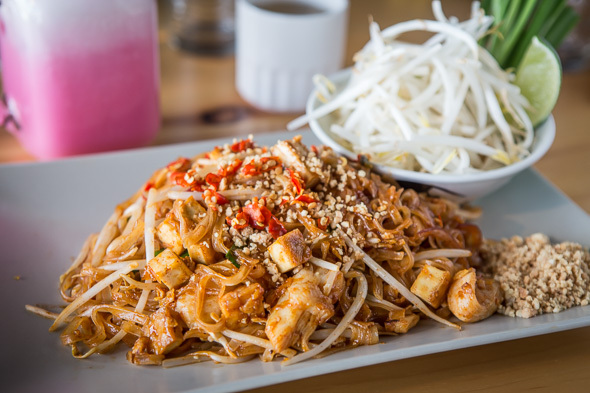 The menu lists stir-fries, noodles, rice and curry dishes that showcase specialties from across Thailand. 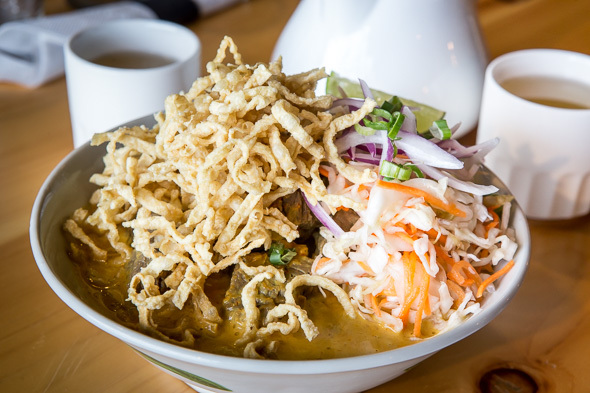 Khao Soi ($11.95), a deep bowl of coconut and yellow curry soup, is one of my favourite Northern Thai dishes, and the version served here is particularly good. Soft egg noodles are submerged within the creamy broth, meanwhile crispy fried noodles on top add crunch along with shredded cabbage, sprouts and onions. I have it with beef, although, chicken, shrimp or tofu and veg are alternate options. 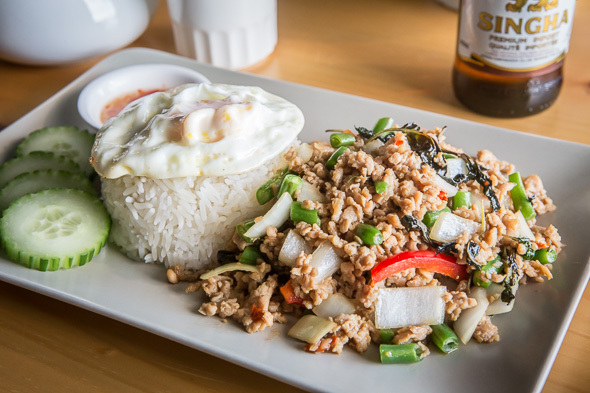 Holy Basil with Egg ($12.95), a.k.a pad gra prow, is accomplished as well. The aromatic stir-fry of minced chicken (or beef) comes studded with green beans, chilis and basil. It's accompanied by a fried egg over rice, which is my only qualm. I'd much prefer to break the yolk over the meat than the rice. Pad Thai has become a dish I largely ignore these days for fear of being served that sweet neon orange sauce and sticky rice noodles that clump together, but Jatajuk has earned a reputation for serving one of the city's best . The very respectable version ($9.95) here features vermicelli tossed in tangy tamarind sauce with scrambled eggs, tofu and a choice of protein. Crunchy sprouts, chives and crushed peanuts are supplied on the side. Spice levels are customizable but Suksaen warns that hot is equivalent to "Thai spicy" while medium is best termed "Canadian spicy." Mild is entirely absent of chilis. Even still, his regulars order extra extra spicy. 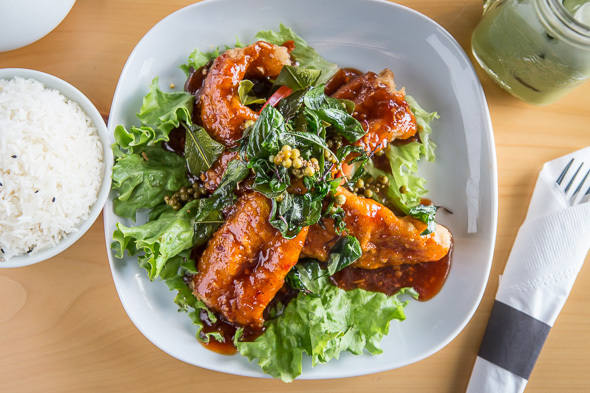 Finally, there's Pla Rad Prik ($11.95), deep fried basa painted in fiery basil sauce and garnished with baby peppercorns, fried basil and lime leaves. It's my favourite dish of the day; the fish is incredibly supple and moist while the exterior is crispy and candied in a sweet, sour, and spicy glaze. Dining family style is recommended to sample the most dishes, but many of the menu options include rice and would make for suitable solo entree too. Lunch specials are offered from 11 a.m. to 3 p.m. and will set you back just $7 or $8. They can be bulked up with a salad, spring roll and beverage for just $2.50 more.